Honestly, ranged damage is a field that’s never quite appealed to me as much as other options for doing stuff. Not just in Final Fantasy XIV, but in anything. I love tanking, I love healing, I love providing solid damage – but give me a choice of how to do so, and I’d rather be up in the paint slicing something’s face off than attacking from a distance. And that’s with my love of gunplay. Still, that doesn’t mean that FFXIV‘s ranged damage needs to suffer, does it? Although it really sort of is suffering, at the moment – neither Bards nor Machinists are in a great place, though arguably the former is in a worse place than the latter at the moment. But let’s take a look at both of these jobs, what their expected roles are, and what makes them cool or not – you know, the usual. I’ve done this column format twice before, I assume you recognize it by now. I legitimately feel sorry for people who have stuck with Bard (née Archer) through the game’s entire lifespan. Disregarding the innate weirdness of the first version, the conception of what Bards are supposed to be has shifted a lot. Backup healer? High ranged damage? Support character with somewhat ineffectual support? A relentless mashing together of two concepts with only the most tangential connection between them? Definitely the last one, but you get the idea. As the first (and for a long time, only) ranged damage job, Bard set the stage for what was expected of the whole category – specifically, a support-ish DPS. You trade raw damage for the ability to help the part as a whole. Whether or not this effort has been successful is another story altogether, as I’ve opined elsewhere that the support effects are too weak on the exchange, but that’s the notion. You sing and make the group better, and in the interim you keep peppering things with arrows. Heavensward ushered in a major change by shifting the job to having a cast-style bit of gameplay via the ironically named Wanderer’s Minuet, but the core gameplay hasn’t changed too much on a conceptual level. Apply DoTs, use your on-cooldown attacks, and then wait for procs whilst keeping up your crit buff. Sing when the group needs it. Which leads to disconnect for players who got used to one of the many other version of the job over time, and in this case, that’s kind of legit. Have I mentioned it’s changed a lot? Niftiest Ability: Iron Jaws. Bard, as I mentioned, is all about keeping its two main DoT effects going, and it has some pretty important proc effects off of those slow bleeds. (Well, slow poisons and slow whatever-the-heck-Windbite-represents, same diff.) I’m very impressed that one of the new tricks for Bards in a largely underwhelming set gives them a tool for controlling that duration withoutjust falling back on re-applying them; it gives Bard something useful amidst the many other DPS jobs working to keep up damage ticks. Lamest Ability: Warden’s Paean. Status effects are, let’s face it, not a huge deal in FFXIV insofar as the ones that can be cleansed are easily dealt with, and the ones that can’t be cleansed are part of the mechanics. Basically, this is a proactive Esuna that no one asked for, with the added detriment that many statuses which can be blocked by it in theory are targeted randomly, making it largely useless even if you do know something is coming. 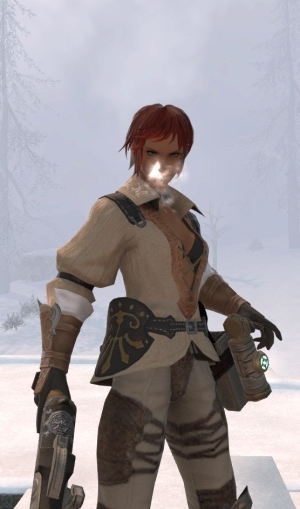 There has only ever been one picture of what Machinist is supposed to do, because it’s only existed for this expansion. That simplifies matters somewhat. Of course, it’s also a shoe that people have been waiting to drop since the game first launched, and the presence of this drop feels oddly anti-climactic. It’s not what was expected, and it leaves people still making eyes at the Musketeer’s Guild and wondering if they’ll have a shot. You see what I did there, I’m sure. 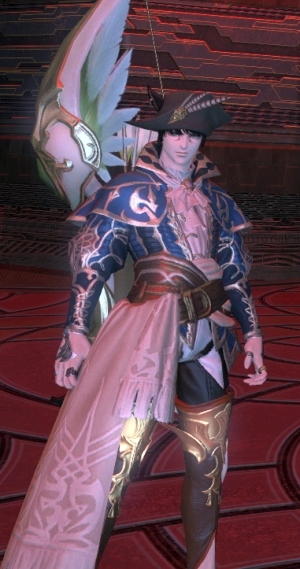 Regardless, Machinist’s gameplay is very much a derivation of what Bards were already capable of doing; rather than relying on applying DoTs and praying for rain, the class focused from the start on just spamming skills and praying for rain. The changes to Quick Reload help matters a bit, though, and turrets are pretty baller. It still has issues, but it’s not quite as severe as it was back at the expansion launch. Niftiest Ability: Ricochet. I’m very fond of how this ability shakes out in terms of mechanics – it’s a dual-purpose AoE and single-target bomb. Use it on the boss when your Wildfire is up, use it on a pack of enemies early, use it whenever you need to deal damage and let it scale properly to your needs. I’ve made it clear how much I like modal abilities, and this one is both modal and smart about its modes. Lamest Ability: Wildfire. In theory, this is a really cool ability, applying a big damage burst after a few moments of coordinated damage-dealing. In practice, it severely penalizes Machinists fighting bosses with any sort of invulnerability phase if they don’t time it correctly, and its actual mechanics don’t lead to interesting gameplay – you just save up everything for one concentrated attack. So the gameplay of the job becomes waiting for one moment, then unloading everything in a burst, then waiting for a minute and a half or so. As always, feedback is welcome down below or via mail to eliot@massivelyop.com, same as every week. Next time around, we’re going to talk about what we know about 3.1, the content gap we’re stuck in, and what happens next – as well as speculating a little about what we don’t yet know. By way of postscript, I apologize for my absence last week, but it turns out driving up the entire East Coast of the country is really hard. Who knew? They don’t need to reinvent the trinity,they just need to make things more important than the enemy health bar. The trinity needs to expand I agree. The dude has a feathered bow, a sash, golden chaps and porcelain white skin. Oh, you manly man, you! I still wonder why they went the route of ‘dpsupport’. That’s something I don[‘t approve of all the companies doing now. You get in one party and they are on you for not playing enough songs, you get in another and they are on you for not doing enough dps. It’s kind of why I just play BLM and DRK because when I’m doing something, I just want to do that, not ten million other things at the same time. I really wish they had more pure support classes that are designed as support first, dps second like the old RDM used to be. This Jack of All Trades trend has gotten old with me faster than I thought it would in the past decade. Bard and Machinist support is still REALLY powerful. Perhaps not as valuable for 4 man pugs (though foe’s is useful in every party since healers should be DPSing, and it gets bonus value if you have a mage), but there’s a reason that one or the other is wanted for every group ever. MP (tho not so much the TP) regen on demand is still really, really powerful. Bard also still plays the exact same way it has before, save for WM making you a bit clunkier. There’s no “five people can argue it’s played differently,” Bard plays a priority system based on what procs they get and the value of said procs. I’m sorry Eliot but you keep missing the mark with these “state of” articles. The state of tank article was EXTREMELY atrocious, melee DPS was actually pretty okay, the crafting article completely missed the plethora of issues the current system has, and this article was also filled with inaccuracies. If it’s anything like Gauss Barrel for MCH, it’s a dps increase to keep it up the whole time, though only slightly. This information coming from what I’ve read in the official forums, I’ve not actually parsed anything myself. Bannex19 Right, because Bard is the only Job in the whole entire game to play. Loopstah At least they have bow strings. WoW didn’t have bowstrings for almost a decade.